The Black Brand Fahrenheit Kooltek jacket and the Fahrenheit Kooltek Perforated jacket are both on sale! 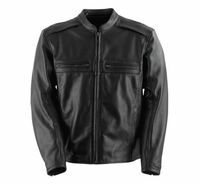 These jackets are a full leather, heavy duty style with features to handle a wide range of temps. They also have a full set of D3O armor which is a premium upgrade. The shoulders, elbows and back are all equipped so there is nothing else to buy. The fit of these jackets is pretty easy. They are a “relaxed” style with an American cut. Average to stout body types will appreciate the full cut design. Both the solid and perforated versions use the KoolTek leather which is treated to radiate heat away from your body and run cooler than ordinary leather. The solid leather jacket has a thermal liner included and the perf jacket has a wind stop liner included. The solid jacket will work best in cold to mild weather and the perf jacket will be for mild to very hot weather use. Black Brand says: The Fahrenheit KoolTeK features amazing technical innovations starting with KoolTeK, a process in which the top-grain leather is treated to resist the sun’s heat and stay about 20° cooler than traditional leather on a sunny day. Inside you find supple, flexible D3O® armor and a 37.5® moisture- and odor-wicking liner, making it the best, most versatile leather-riding jacket you have ever owned. Zippered sleeves for comfort fit. Black Brand logo embossed on sleeve. Reflective trim blends discreetly into back panel.